Neapolitan pizza: Slow Food or Fast Food? It was 1982 when the Italians, too, for the first time, came across hamburgers and fries. With the name Burghy, the first Italian fast food opened in Milan and, in a short time, across central and northern cities. From a few eateries in Milan and its surroundings, fast food settled, in just over three decades, with its layers of mayonnaise and ketchup smeared on lettuce leaves and slices of tomato, the oiled cones of fries, the breaded chicken buckets and the iced soft drinks, in every corner of the Bel Paese, forcing its culinary heritage with its strong traditions to fight, several times, with a way of eating very different from the truly Italian one. I also remember when the first McDonald’s restaurant opened in Rome, in Piazza di Spagna. But, fast food is not just sandwiches, it is rather a different way of eating without any identity. Surrounded by an aura of inevitability, as if its presence is inexorably obvious, fast food is everywhere: in a shopping mall, in a train station, at the airport, in the so-called non-places, non-historical, non-relational, and not concerned with identity spaces. Places where, in single file we mix up with the others and, acting in complete anonymity, we get lost behind the plastic tray on which our order, strictly cooked in a very few seconds (and to be eaten at the same speed), is placed and the handful of coins to get it. Despite the quality of what – frozen, precooked or canned – the big chains offer, the fast food industry attracts armies of people of all ages and, above all, thanks to marketing strategies, the children, their main target, to which they provide ad hoc menus that, in addition to the meal, propose a surprise and equipped play areas. Thus, they will never separate. However, there are also those who, on the other hand, for some years on, distanced themselves from it, opposing to the fast drinks and sandwiches the home cooking, in its many and varied aspects, and the pleasure related to it. Like a movie in slow motion, the movement started by Carlo Petrini challenged the industrial civilization blind demand for productivity and efficiency to slow down the pace in the name of regional flavors and recipes, local resources and habits, artisanal productions and skills, environment and sustainability. Lost its elitist character, Slow Food, now branched around the globe, incites, with louder and louder voices, repeating “good, clean and fair” like a chorus, to wonder and to recognize where the food we eat comes from, who produces it, what time of year, if it respects the rhythms of the seasons and the places where it is produced. At present, while another multinational company is landing in the major cities around Italy, the red escargot continues its march, slow but unstoppable, finding other products to safeguard, preventing their extinction, as the many new presidia. Talking about the presidia, I open a small parenthesis on the Neapolitan pizza that, for a long time, has been included among the examples of fast gastronomy. There is no doubt, we can consider the fast waiting service for it, given that it requires a minute or so to be cooked and 40 seconds of manipulation and garnishing. But, apart this, we deal with hours and hours of the dough balls leavening (14/16 hours), the selection of the flours to be used to make them, the careful search for the toppings, some of them may be show the label Slow Food Presidia, the observance of seasonality, the attention to the mise en place, the use of ancient pizza equipment (wood-fired ovens), the reverence for the producers, especially if they are small producers, the indisputable craftsmanship of the making process and, last but not least, the great force of the tradition. We must acknowledge, in the light of a recent dispute too, that we are facing a war of the worlds. Two great worlds are arguing, two realities at opposite speeds. And, as stated by Umberto Eco: “The search for people’s roots, also with regard to food, belongs to the people, today, even more, for the phenomenon of globalization. 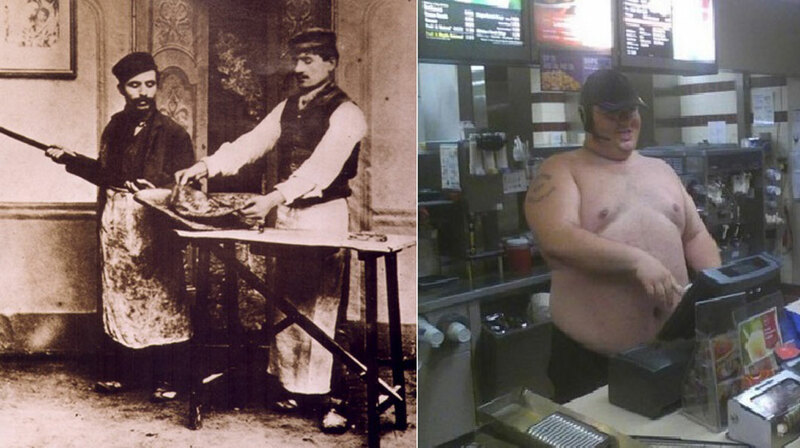 It can be said that the stronger McDonald’s is, the greater Slow Food becomes”.